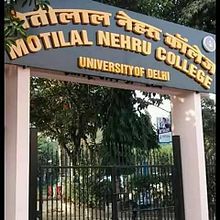 Motilal Nehru College (Evening) is one of the famous South campus colleges of the Delhi University. Often abbreviated as MLNC (Eve), established in July, 1965 and marked its Golden Jubilee in the year 2014. MLNC (Eve) provides seven undergraduate courses to students in Humanities and Commerce streams. The logo of the college is shown below with the motto “Knowledge purifies the mind” in Sanskrit. 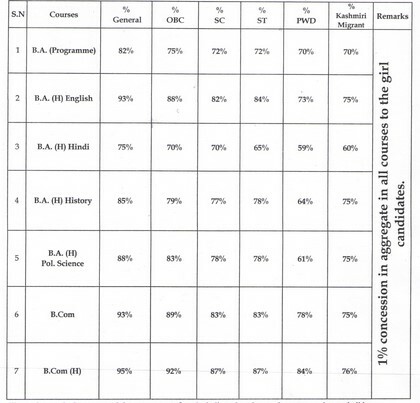 The cut offs for the various courses of the college are not very high. Henceforth, around 1 to 8 cut off lists are put up for the admissions. Mostly after 3 to 4 cut off lists, the process of admitting students might get closed due to the unavailability of seats to some of the courses. Therefore, a concession of 1% in the aggregate for all the courses is given to all the female candidates applying for MLNC (Evening). 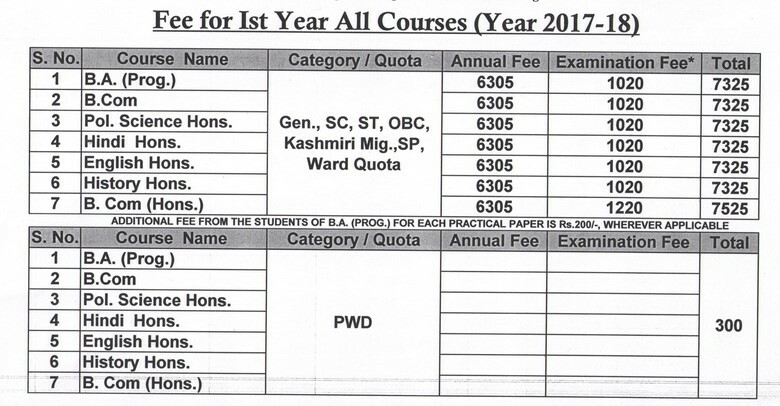 The 5th list would be published on 18th July as per the college website. For all the courses vary for students belonging to different categories. Consequently, different reserved categories such as SC, ST and OBC have a reservation of seats up to 15%, 7.5% and 27% respectively. Also 5% reservation is available under the PWD and sports quota equally. For the sons/daughters of Kashmiri migrants 5% of the total seats were reserved. 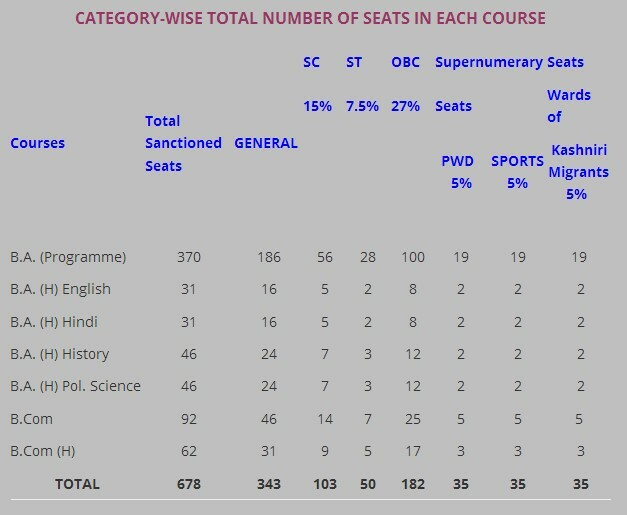 In addition, the distribution of seats in a tabular format for a better understanding can be seen below. As you know, Adjacent to the South Campus of the Delhi University (DU), situated on Benito Juarez Marg. Therefore, it makes the transportation and commuting facility a lot easier for the students because of the well connectivity it has via the Delhi Metro and the Outer Ring Road. The officiating principal of the college is Dr S.K.Sharma. In addition to that, the campus of the college has about over 140 members in the teaching staff. The campus has an air conditioned library with around 50,000 volumes of books on different topics. Also the library keeps on adding to this number by incorporating books related to different fields every year to ensure knowledge to be imparted to all its staff as well as students likely. It also has an E-Resource centre with more than 40 computers. The college also boosts about having a common commerce computer lab containing around 60 computers. The campus also contains hostels and PG’s for its outstation students. The evening timings of the college allow the students to take up part-time jobs or other courses . Therefore it helps them build up their careers and do some recreational activities as well. The fee structure of the college is not very high. In fact, quite affordable for all the students and hence listed as one of the most sought after colleges in the South campus of the University of Delhi. The fees for the courses range from 7k to approximately 25k till final year. There are a number of Societies and Associations in the college which play an important role in the academic as well as the social life of the students. These societies are responsible for organizing various activities, lectures, seminars and discussions. The college also provides facilities for games like football, volleyball and badminton. Annual Day Fest: MLNC (Eve) celebrates its annual day with a lot of zest. Students receive prizes in 3 categories namely, academic excellence, extra-curricular activities and sports. National Service Scheme (NSS): It allows students to indulge into community services. Career counselling and Placement committee: This committee is responsible for looking after the placements of the students and also provides necessary counselling to them. National Cadets Corps (NCC): various activities held under the NCC group which helps in the team building skills. Student’s Union: The students of the college form members of the Delhi University Student’s Union. Cultural Activities: Various activities such as the famous event ‘Mirage’ conducted throughout the year. Khem Chand Jagirdar: Chairman of the Governing Body, Motilal Nehru College, University of Delhi. Kapil Singh: Sub- Divisional Officer of the Government of Uttar Pradesh. Suresh Harmilapi: Director of the Sports Authority of India. Karan Singh Tanwar: MLA of Delhi Cantonment, New Delhi. Sat Prakash Rana: MLA , Delhi. Dr. I.P. Singh: Ex- Joint Secretary of the All India Congress Committee. Munish Tamang: Senior Lecturer at Motilal Nehru College, University of Delhi. Rajeev K. Bhatnagar : Assistant Regional Manager at The Hindu. Radha Krishan : Private Secretary of the Ministry of Human Resource development, Education Department, India. Motilal Nehru College (Evening), DU has provided a number of opportunities to its students. So if anyone of you are thinking of applying to any DU college, then you may also give MLNC (Evening) a try!